In the mountains of Rogaland, Ryfylkeheiene, you find many old sheep tracks. Many are still in use, but some are forgotten. The drovers take the sheep from the lowlands up to the grazing land in the mountains for the summer. The mountain farm, Viglesdalen, has always been a farm having wide grazing land in the mountains. Many different routes lead to those pastures. The same sheep tracks have been used for hundreds of years. The sheep track along the Lake of Viglesdalen, Viglesdalsvatnet, was built in 1912. Before that, the track started at Bergaland in Årdal, went further on up the hills of Bergaland and Rivjaland, up to Tverrgjøvlet and then to Steggjadalen. Another route started at Åse, went down the valley of Rausdalen to Viglesdalen. On this route however,they had to cross the river Storånå, and this was no joke at autumn time. 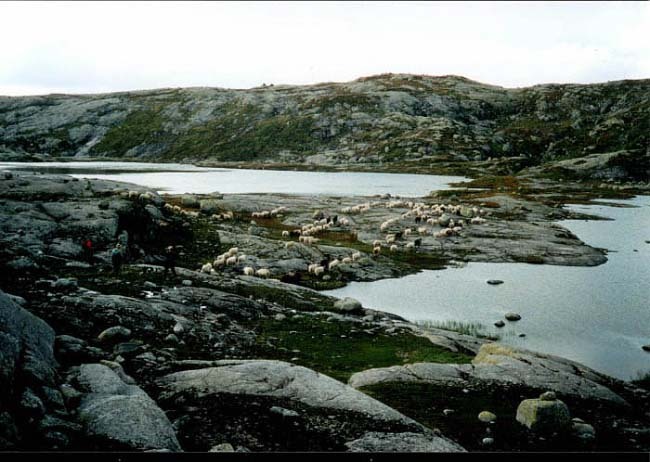 Droves of sheep have also been taken along Tysdalsvatnet and up the hills of Hia, and from there to Steggjadalen. 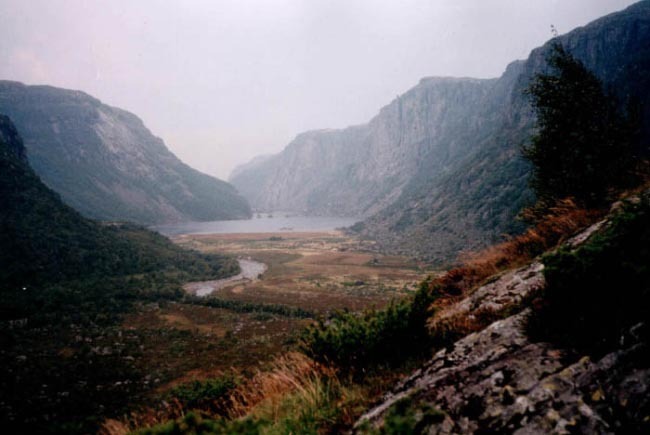 The border of Viglesdalen today is Musdalen, Nlisebuvatnet, Storhidlervatnet along the mountains at Stakken and out to Uførdalen towards Hia. 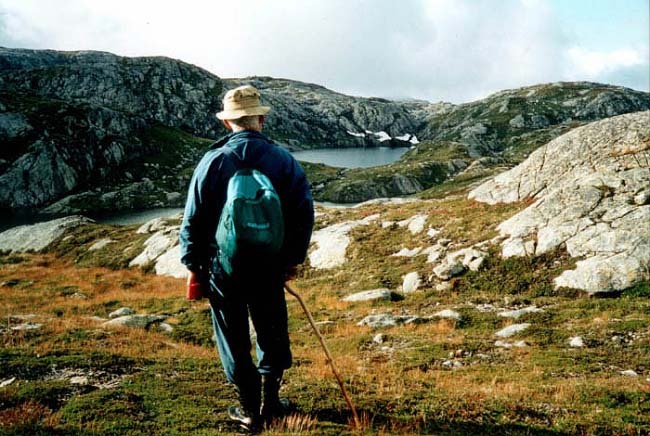 Now, let's have a look at one of the old sheep tracks in this area, the route from Viglesdalen to Krokeholet. For some time a mountain pasture for temporary farming in Krokeholet belonged to the farm in Viglesdalen. June is getting on, and the sheep are to be taken to the mountains. The drove must get ready. Every sheep shall have a painted mark on the wool. They shall also have a bell. Medicines against intestinal worms shall be given. The sheep that are not quite well, have to stay at home. Every sheep has an ear mark, together with ear clips with the number and name of the farm. 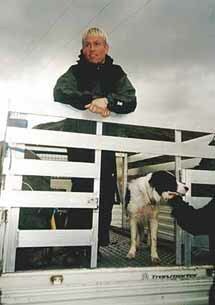 When the drove is ready to leave, the sheep are loaded into a special truck for sheep, and they are taken to Nes. In the past they had to be driven to Nes by foot, but it's good both for sheep and drovers to get a lift part of the route. From Nes everyone starts on foot on the old track. Within three hours the drove comes to Viglesdalen. From here the track is very steep, climbing up Benkjene. 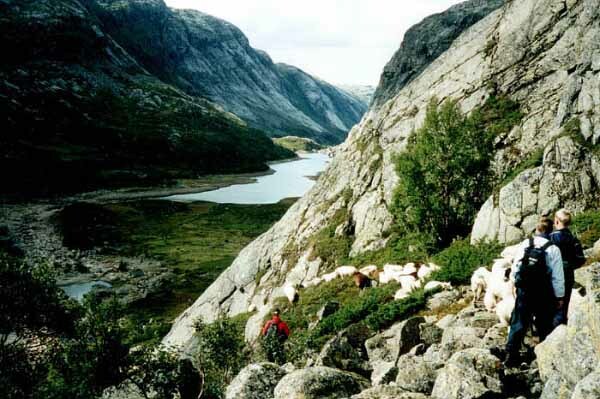 Coming to the top, you will see Steggjadalen with the little cabin and the sheepfold. A long break with coffee and a rest is needed, maybe a stay overnight. The farmers having their grazing land by Nilsebuvatnet, usually drive together. But sometimes each farmer goes with his own drove in the springtime. 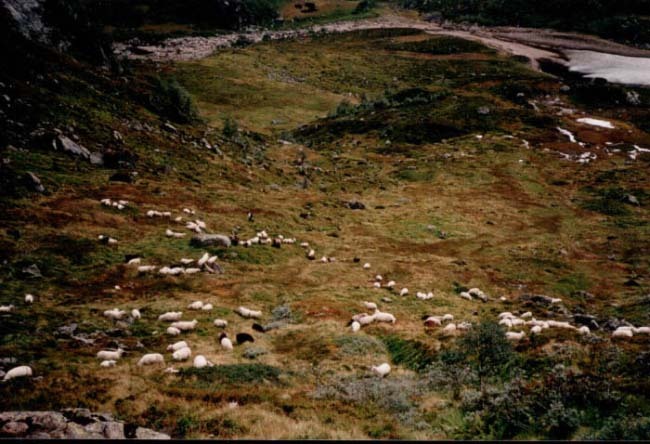 The sheep are left at Longåsen. Very soon they will find their own way to the same place as they grazed last year. 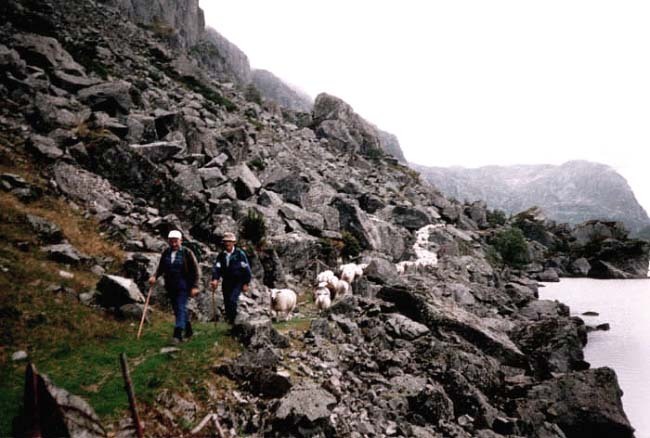 The sheep have been taken to the mountains like this for generations, knowledge given from father to son. 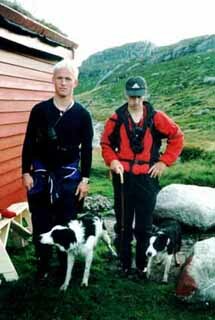 Hallvard and Ole Kristian have followed the sheep drove to the mountains since they were little boys. 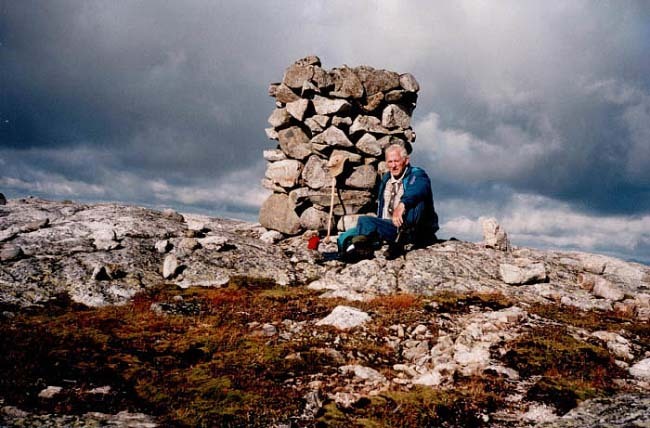 Per, who is used to the mountains, can remember the first time when Ole Kristian joined the drove. He had to cling to a rope from Per's backpack to manage the steepest parts of the track. The sheep are left alone in the mountains until September. The owners take a walk to the pastures now and then during summertime to see if any sheep hasn't got stocked in the mountains. And then, in September, the gathering of sheep starts. Hallvard and Ole Kristian have got their own herd little by little. Kjeld comes from Denmark to take part in the gathering. He loves sheep's turd and wet woollen stockings. 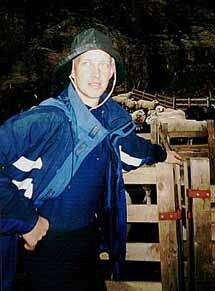 He has sheep at home in Denmark, and he wants to see how they are kept in Norway. " Norway is a grazing land." (Jon Sæland). Per doesn't keep sheep, but likes to walk in the mountains. He doesn't get peace of mind the whole winter if he doesn't get this walk to Urdalen in the autumn. 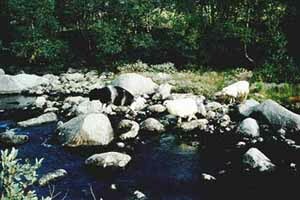 Ottar is the oldest one, and he has followed the drove of sheep for forty years. He has seen an unbelievable lot of, "Finnskjegg ", (spikenard, Nardus Stricta). This gang start the gathering of sheep together. 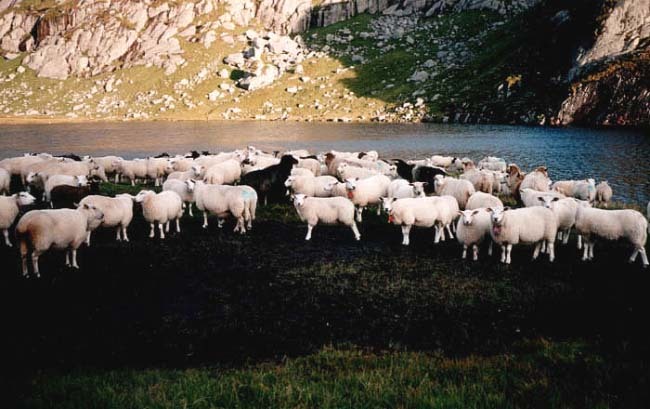 Each person chooses one part of the grazing land to seek for the sheep. 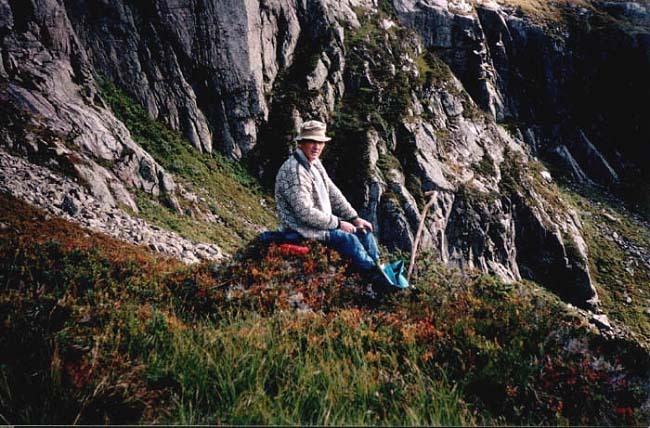 When he finds some, he drives them down to the narrow valley, Krokeholet. One of the drovers have to sit at the most narrow point down to Krokeholet to look after the sheep to prevent them from coming up again. Kjeld has been a master of that. Therefore this place is called " Danskestredet,"(Denmark Strait). Airphoto ( 5 photos) of the Old Sheep Track , 17.05.99.Taken from the south towards the north. To the east : Nilsebu. To the west : Viglesdalen. To the north : Towards Stakken. 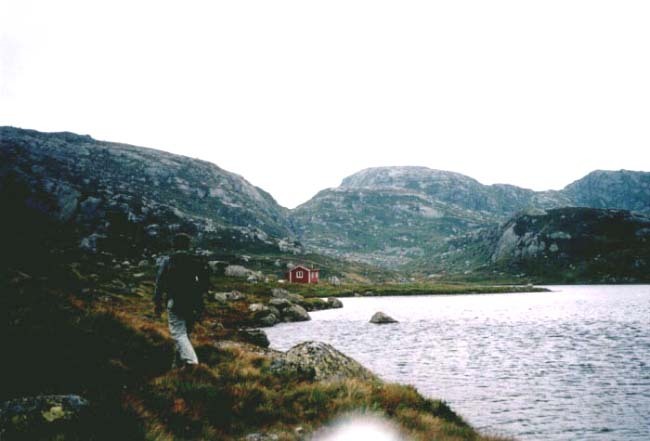 The Old Sheep Track is marked from Krokeholet towards the east to Steggjadalen and down to Viglesdalen. In the afternoon the gang take it that they have found most of the sheep. The walk on the old track back to the lowlands starts. Kjeld opens the " Danskestredet," and the sheep get started on the hills of Krokeholet. Per has arrived from Urdalen and has passed by the valley of Longåsen. The terrain slackens down to Grøne Hidleren and Breigate, many ups and downs before they come to Juvet. This place is always difficult to get the sheep across when the brook is in flood in the autumn. The sheep are crossing Juvet. A big snowdrift to the right. Sept. 1999. 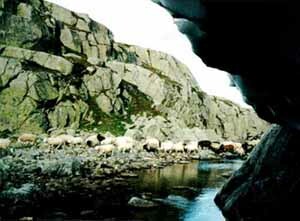 And then they move down Slengjen and towards the sheepfold in Steggjadalen. Here the drovers and the sheep take a rest. The sheep lie down in the fold . In the little cabin the gang is making the traditional dinner from stockfish, onion, bacon and potatoes. Soon they lie down, too. The next day the drovers are looking for possibly missing sheep. One of the drovers takes the main drove of sheep down to Viglesdalen. Sheep and drovers arrive little by little during the day. The drovers sleep in the shepherds' cabin this night. Early next morning the drove goes down along the Vigledalsvatnet to Nes, and here the sheep are pushed into the sheepfold where they are separated and taken into each owner's fold. With this tradition Hallvard and Ole Kristian are grown up. Will they go on using the Old Sheep Track ? A new millennium has come. 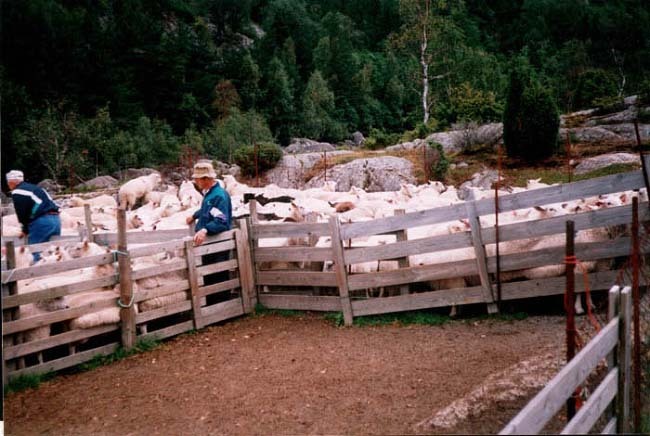 This year, the year 2000, they loaded the sheep in trucks and took them to Lysebotn and straight up to the pastures by Nilsebuvatnet where the road from Lysebotn ends. The gathering in the autumn then started in the mountains , and the sheep were driven down the hills to Krokeholet. Efficient sheepdogs were running along the hills, and the sheep were driven towards the dam by Krokeholet, Krokeholsdammen. Almost every sheep was found the first day, loaded into the truck , and brought safely home the same day. In the evening, in a cabin at Stakken, the tradition of making the stockfish dinner was kept. The next day only a few sheep had to be found. The gathering was quickly done. Time is money. A new millennium with new thoughts and new ideas has arrived. Hallvard has got the sheep in the fold. He is pleased with the new way of gathering the sheep this year.